I've lost count of the number of times I have been disappointed by supermarket-bought strawberries. Often lacking in the taste department (and usually not even fully ripe! ), they're a bland, hard offering next to the home-grown alternative. It's no wonder really – these strawberries have to travel long distances and must be able to withstand the knocks that go with it. It means that the varieties of strawbs destined for stores must be hard-skinned and exhibit a long shelf life. This is fair enough really, as the store owner has to be able to make a profit. Nevertheless, these qualities are in perfectly inverse correlation to what we discerning kitchen gardeners are after! Strawberries are without doubt one of life's little luxuries and to get the best you have to grow them yourself. Thankfully this isn't difficult and summer's the ideal time to break ground and establish your own productive – and oh so delicious – strawberry bed. Grow them on the productive plot and you can try out a range of varieties, each with a subtly different taste and each selected to extend the cropping season to as long as blissfully possible. It is worth positioning your strawberry bed in a warm and sunny part of the garden, avoiding any frost pockets so that the springtime flowers don't get clobbered and turn to mush. The warmth of a sheltered spot will also encourage the fruits to develop their full aroma – picked in the gentle heat of summer's afternoon your strawberries will have a truly irresistible scent and their flavour will be that much more pronounced. The plants have shallow roots, so the soil you grow them in needs to be rich and free-draining, yet able to hold moisture. Initial ground preparations can go a long way to improving ground conditions if yours is far from ideal. Double dig the soil, incorporating plenty of well-rotted organic matter such as garden-made compost. 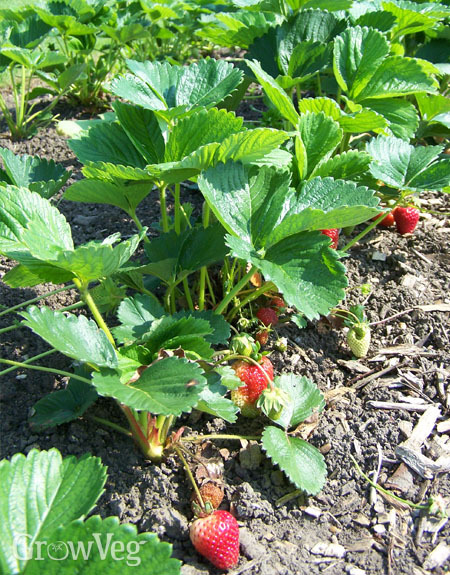 If you have a clay-based soil, improve its drainage by planting your strawberries atop ridges or into raised beds. Strawberries are members of the rose family, so avoid soil that's had roses or other family members growing in it; at this stage a clean start free of any potential soil disease issues will make all the difference. Think logically about the layout of your strawberry bed. Plants will need to be spaced 45cm (18in) apart within the row, with rows set at least 60cm (2ft) apart. It is far better to make your bed two or three rows wide than to have one long, single row. A squat rectangular bed such as this will be easier to net against birds or protect with fleece at the crucial flowering stage. In summer you have a choice between planting potted 'cold-stored' plants or fresh, bare-root plants raised by mist propagation. A wider choice of traditionally raised bare-root plants becomes available from autumn. Whatever type of plant you decide to start off with, it's worth growing a range of different varieties, of which there are two options to select from: short-day types and perpetual types. Short-day varieties initiate their flowers while the days are still short (in early spring) to yield their tempting fruits by summer. Select three or more varieties of short-day types with different cropping periods and you could be picking fruits from early summer, or even late spring, right up until late summer. A suitable season-maximising trio might be, for example, early 'Honeoye' followed by mid-season 'Hapil' and concluding with late-to-crop 'Fenella' (each, incidentally, boasting superb flavour and performance!). Perpetual varieties crop in bouts throughout the summer months. While this is undoubtedly an advantage, plants tend to become exhausted after just two years, compared to short-day strawbs which will carry on fruiting for four to five. The canny grower will set up their strawberry beds in such a way that each new bed is planted one year before a mature bed is due to retire, thereby ensuring no interruption to supply. Set strawberries into the ground so that the crown of each plant (where the stems emerge from the base of the plant) sits on the soil surface. Don't rush this job! Crowns set too deep run the risk of sitting in damp soil and rotting, while crowns left too high could dry out and fail; getting the balance right is essential. Bare-rooted plants will need their roots fanned out into the soil so that they can have fresh space to root into; trim any excessively long roots to about 10cm (4in). Water the plants into place to settle the soil around the roots and then keep the ground-free to give your plants a trouble-free start to life. You will need to keep a close eye on soil moisture levels to keep these shallow rooters happy. A mulch will help lock in the moisture but be careful not to swamp the delicate crown at this early stage. And now the hard part – you must resist the temptation to pick any strawberries during the first season; wait until next year. Hard as it may be, should your plants start to flower you must cut back the flowering stems to where they emerge. This hard-heartedness will pay dividends next year with more fruits from bulkier plants. If you already have healthy, disease-free and vigorous strawberry plants then it's possible to propagate them from the runners they produce. These small clusters of leaves at the tip of long, wiry stems can be pushed down onto the soil or pots of compost in order to root. Peg or weigh them down with a stone to ensure the base of this cluster is in contact with the soil. Within a month or so the runner will have rooted and can be cut free from the mother plant and relocated to a fresh strawberry bed. You can read more about propagating from runners in our article How to Grow New Strawberry Plants From Runners and the general care of established strawberries in our article Summer Strawberries. With a strawberry bed up and running you can look forward to summers of sweet, aromatic bliss. If you've yet to try home-grown strawberries let me assure you you're in for a real treat! "Hi Ben I have an allotment and have a large amount of strawberries in waste bins the majority (like 50 bins) planted up 3 to a bin as runners from a previous crop. last year I purchased seperate different varieties and got a nice small crop of strawberries, they are now producing runners and I am potting these up for replacement. 1 Please could you advise as to amount in a bin. the bins are on a wood frame that I built so I can pick fruit standing up. 2 please advice to soil mixture and depth of soil and future soil treatment and any thing else that will give me a good crop of strawberries next year, as I had a poor crop this year which I put down to the weather!" "Hi Peta from France here- last year I planted the "runners" from our original plants of perpetual strawberries - this year they were brilliant- cropping very early but Since then almost nothing -. They seem to have damaged leaves - sort of blackened and motteled with brown patches. I have twice given them a "haircut" and burn the offending cuttings. Can you tell me what is wrong? and is it worth planting the runners from these plants - the centre of the plants look really healthy and although late - the next crop is developing, so we are being patient thanking you in anticipation"
"Hi Ron. As long as you space each plant about 45cm (18in) apart in each direction you should be fine. As far as compost/planting medium goes, it doesn't matter so much, as long as the compost you use is good quality. General, multipurpose compost is cheap to use but will need regular watering in warm weather. Soil-based compost, such as John Innes Number 3, will retain moisture better and be slower to dry out. When the strawberries start to flower consider feeding with a liquid tomato feed or liquid seaweed concentrate. The compost should be fine for the life of the plants, so long as it is fed during the growing season. You could also consider top-dressing the compost at the start of each growing season with a fresh layer of the same. Good luck!" "Hi Peta. It sounds like your strawberries have either contracted leaf spot (caused by bacteria or fungi) or a viral disease. If it is leaf spot then cutting back the diseased foliage and burning it, as you've done, should suffice. The healthy growth that is now growing is clearly a good sign that the plants have recovered! Make sure you keep up the good hygiene into winter by removing and composting all foliage at the end of the growing season. If plants appear troublefree next year then you could try rooting runners, but I would avoid it for this year - just in case. To be competely sure of healthy plants I would seriously consider buying in fresh, certified disease-free stock for any new strawberry bed, rather than propagating from your existing potentially disease-carrying plants." "Many thanks Thais encouraging -We love our soft fruit and strawberries are among the favourite- as we are usually picking fruit until November I will indeed try a liquid feed- I have to admit I have not fed them since late spring! " "Hi Ben many thanks for your comments I will try this and let you know how I get on. Ron"
"I read that the sour strawberries that I've harvested this year are due to a lack of lime in the soil. Can you confirm this, or is there another possible reason? " "Hello again Benedict, Peta in France again! We seem to have had a poor year as far as soft fruit are concerned after pruning the black and red currants at the recommended time - and seeing the bushes flourish we had not one berry this year- how can that be? the bushes are a lovely shape ( must have done something right there then) full of bright healthy looking leaves. I am now thinking about what to do and when , too ensure a good crop next year - please advise "
"I have a large raised bed of strawberries which were planted by previous owners. I am having problems keeping it weed free. Are there any tips you can give me. I cleared the weeds I could see in it last year but by the end of the summer it was full of weeds again. How can I break this cycle? " "I have a large raised bed of strawberries planted by a previous owner. I just can't keep on top of weed control and even though I weeded it in the spring and put some straw around the plants by the end of the summer it was overgrown with weeds. Can you give me any tips to prevent this happening again. " "Hi Monica. You have two options. Keep on weeding and eventually there will be fewer weeds. You just need to get them before they set seed and spread! Persistence does pay off. Another option is to plant strawberries with a sheet mulch, which will completely suppress the weeds - you simply create holes in the mulch to plant the strawberries. But I would suggest that for an established bed the best option is simply to persist with the weeding. Keep on top of weeds as they appear and they shouldn't get too dominant."